The Black Student Union club at Kennedy has made a comeback this year and has held an Awards Ceremony in the Little Theater on February 23. The purpose of the event was to acknowledge students of African descent, “a group of people who historically have gone unnoticed,” said Maurice Conner, advisor of the club. Over 50 Kennedy teachers nominated students for achievements such as excellence in academics, creativity, athletics, and community service. The award ceremony began with the black national anthem where the audience stood proudly with their hand on there heart, or their fists high in the air. The audience was kept entertained during the entire event by step performances from fraternities, spoken words, and motivational speeches. The crowd was even invited to dance to the Wobble and Cuban shuffle. 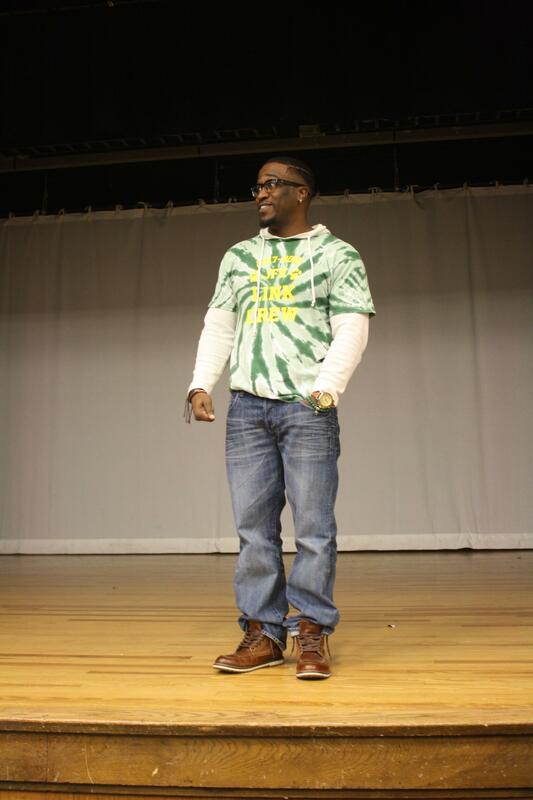 Kennedy counselor Greg Palmer spoke in front of the audience at Feb 23 BSU event. The ceremony included a speech by Greg Palmer, freshmen counselor at Kennedy, about the importance of acknowledging mental health in the black community. An admissions Counselor at Sacramento State University also spoke to students on the many opportunities available to them. A long-standing goal for Connor and many students is to diversify the P.A.C.E program at Kennedy, as well as many of the advanced classes that are offered. Anaise Smith, a sophomore at Kennedy in P.A.C.E, announced there to be “so little” of African Americans in the program. She later admits that she wants to see more friends that look like her and share the same experience as her in her advanced classes. BSU plans to hold events such as potlucks, talent shows, and even ethnic fashion shows in the future. “It’s important for us to be able to come together in environments were we are able to support each other when we know that in so many other areas in the world we are still held back,” says Connor. For any students interested, the club meets every other Monday in room C204.